The cells stay in completely inactive state. Thus, they can be conserved for long periods. Any tissue from a plant can be used for cryopreservation e.g. meristems, embryos, endosperms, ovules, seeds, cultured plant cells, protoplasts, calluses. Certain compounds like- DMSO (dimethyl sulfoxide), glycerol, ethylene, propylene, sucrose, mannose, glucose, praline, acetamide etc. Are added during the cryopreservation. These are called cryoprotectants and prevent the damage caused to cells (by freezing or thawing) by reducing the freezing point and super cooling point of water. This is the first in vitro method of germplasm conservation. The second in vitro method of germplasm conservation is cold storage. It is a slow growth germplasm conservation method. It conserves the germplasm at a low and non-freezing temperature (1 to 9°C). The growth of the plant material is slowed down in cold storage in contrast to complete stoppage in cryopreservation. Thus, it prevents cryogenic injuries. Long term cold storage is simple, cost effective. It yields germplasm with good survival rate. Virus free strawberry plants could be preserved at 10°C for about 6 years. several grape plants have been stored for over 15 years by using a cold storage at temperature around 9°C and transferring them in the fresh medium every year. The third in vitro method of germplasm conservation is low- pressure storage, the atmospheric pressure surrounding the plant material is reduced. In the low oxygen storage, the oxygen concentration is reduced. The lowered partial pressure reduces the in vitro growth of plants. In the low-oxygen storage, the oxygen concentration is reduced. The lowered partial pressure of oxygen below 50 mmHg reduces plant tissue growth. Due to the reduced availability of O2, and reduced production of CO2, the photosynthetic activity is reduced. It inhibits the plant tissue growth and dimension. This method has also helped in increasing the shelf life of many fruits, vegetables and flowers. 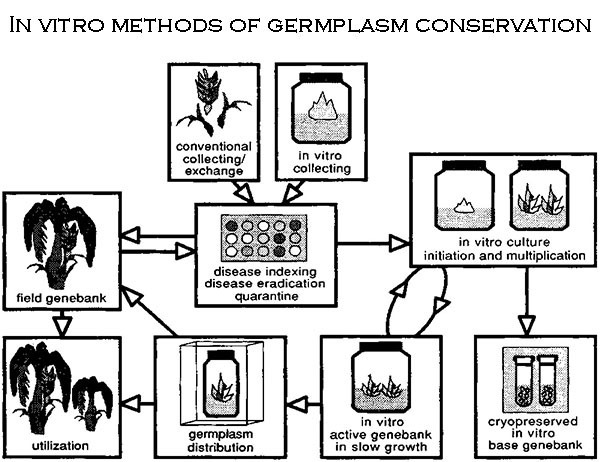 The in vitro methods of germplasm conservation has several limitations such as short-lived seeds, seed dormancy, seed- borne diseases, and high inputs of cost and labour. The techniques of cryo-preservation (freezing cells and tissues at -1960c) and using cold storages help us to overcome these problems. (v) They are ideal for germplasm exchange. (iii) Even shoot tip derived plants may show genetic instability, at least in some plant species. (v) Even DNA may become damaged due to cryopreservation under suboptimal conditions. Slow-growth of plantlets ill vitro provides an attractive alternative to freeze preservation of germplasm as it is simpler, cheaper and very effective. Slow growth may be achieved by maintaining the plantlets either at a low temperature (4-9°C or Ca. 15°C) or on a medium having high osmotic concentration (e.g., 20% sorbitol or sucrose) or both. In addition, the nutritional status of the medium may be lowered to restrict the growth of plantlets. Under the conditions of slow-growth, cultures may be attended to only once in several months. Its subculture may, be necessary only after long periods, once every 12-36 months. For example, grape plantlets stored at 9°C need to be transferred after 12 months; they have been thus maintained for more than 15 years. It has been estimated that 6 replicates of 800 grape varieties can be maintained in only 2 m2 laboratory space, while it would require in the field. It is likely to be used for conservation of valuable genes or DNA segments from threatened species. It can also be used for the conservation of the entire genomes of various germplasm lines of different species.